With an EnergyGuard pool cover you will be able to eliminate water evaporation by over 98%, thus greatly reducing your water consumption and your water charges, as well as saving a vital natural resource. 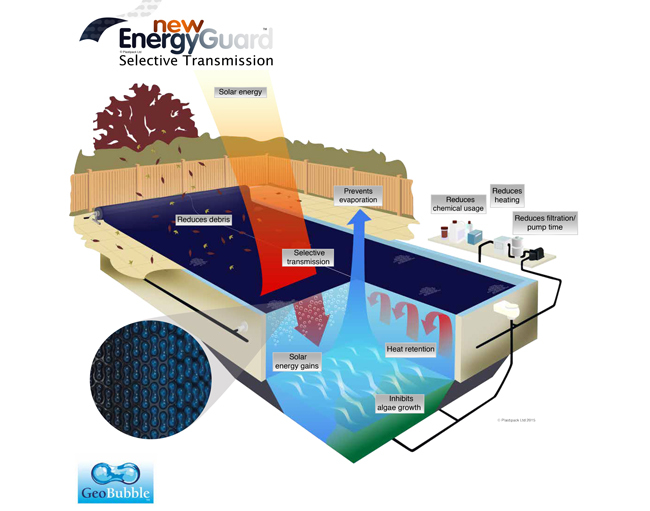 Research carried out in collaboration with the Brighton and London Metropolitan Universities, which proved that the evaporation loss in the UK for an average sized pool, 4m x 8m, is approximately 32,000 litres per year. This figure is considerably higher for hotter climates, and windy conditions. An EnergyGuard cover will save money by reducing water, heating, electricity and chemical costs. The EnergyGuard pool cover can pay for itself in less than a year. The EnergyGuard cover has a 6 year pro rata warranty. By reducing the amount of energy needed to heat and filter your pool water, an EnergyGuard cover will greatly reduce your CO2 footprint. It also conserves water and, at the end of its life, the cover is 100% recyclable. The colour black is known to absorb the sun’s heat in a very efficient way. The top of the EnergyGuard cover is produced with an opaque grey colour that has been researched and developed to have similar characteristics. The sun’s heat will warm the grey surface of the EnergyGuard cover and this energy is absorbed and transferred into the water surface area directly under the cover. An EnergyGuard cover will also help to retain the heat within the pool. You can reduce chemical usage because the EnergyGuard cover inhibits algae growth and eliminates water evaporation. An EnergyGuard cover will provide cost savings by using less chlorine because algae growth will be inhibited by physical means rather than chemical means. The EnergyGuard cover also reduces chemical degradation from photolysis. About 90% of chlorine consumed by outdoor pools is lost due to photolysis reaction. Additional cost savings will be made by using less pH plus/pH minus to correct any pH imbalance caused by algae. All chemical levels and treatment should be maintained at the manufacturers recommended level. Filtration time can be cut by up to 50% when algae growth is inhibited. This will greatly reduce your electricity usage.Filtration will still be required to remove dirt/impurities from the pool and to circulate the water. A 50% reduction is achievable with regular pool use/bathing loads. If the pool is heavily used there will need to be more filtration. You can reduce your pool heating costs because an EnergyGuard cover will eliminate evaporation and greatly reduce heat radiation. Heat retention tests carried out in collaboration with the Brighton and London Metropolitan Universities, showed conclusive energy savings of over 50%. This applied to oil, gas, electric heater or heat pump usage. Where solar heating is used, it is possible to invest in up to half the amount of panels normally required for a pool without a cover.